A terrific value for the classroom! 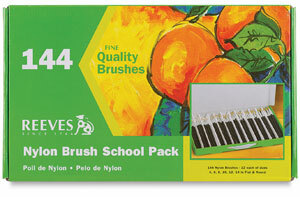 Longer handles provide superb control for elementary-school age children and include a seamless aluminum ferrule. Nylon is useful for a variety of media, including acrylic and tempera. This 144-piece assortment includes 12 each of Flat brushes in sizes 4, 6, 8, 10, 12, and 14 and 12 each of Round brushes in 4, 6, 8, 10, 12, 14.